Indiana always been an exciting place for me. In my whipping back and forth from Michigan to Oregon over the years, that 45 mile corner you touch as you round the very bottom of Lake Michigan has always been a bit tricky. Be it road construction, pissed-off gas station attendants or volatile citizens ready to throw down, I was always on my toes in that little shoulder of Indiana. A couple years back I headed down to Indianapolis. And then down into Southern Indiana. And then over towards Cincinnati through the countryside. And up along the eastern side. And across the top. 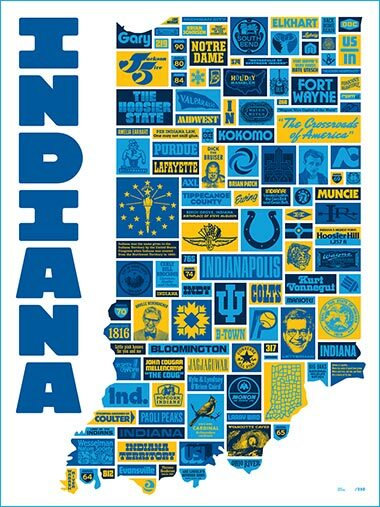 And in those travels, I got to see a lot of Indiana, and man, it was beautiful. Bloomington? Done. Loved that little town and all the green around it. I’m going back. What I knew of Indiana for all the years up to these travels was “the smell of diesel smoke” and “industrial waste around Gary.” Pretty unfair, really. Myopic. When Ron Myers of Fort Wayne invited us to come and tell our story, we INSTANTLY accepted. Couldn’t pass up the opportunity. And damn, our very favorite Nate Utesch lived there, so it was a win/win sort of thing. The show went off without a hitch! Killer venue, crowd, posters and overall Indiana spirit! Thank you for coming to the gig! We sold it out. And with this chance to come tell our story in Indiana? We HAD to make a poster. And that’s what we’ve got cooked up below. Crossroads of America! 01. Printed on thick, durable, bright white uncoated poster stock. Serious stuff. 02. Four colors! Inspired by the Indiana flag. With certitude from Bob and Drew! 03. 18” x 24”! Ample area to pack in a ton of Indiana. 04. Proudly printed by the technicians of The Half And Half over in Columbia, SC! 05. If you need to get in closer, let this link do the trick: Nice and big right here. 06. Just the perfect blast of spirit and color to enhance that house in Gary, Indianapolis Speedway garage, Fort Wayne design shop, Kokomo halfway house, Muncie halfway house, Paoli Peaks warming shack, Purdue classroom, Bloomington record store, Hoosier Hill shack, Notre Dame locker room, Elkhart small business break room and pretty much any other Indiana application. Gu-aaron-teed to perform. 07. Dedicated to our John Cougar Mellencamp, who needs to be nice to his fans.